This year the 2016 Bali terror bombing threatened, by an unknown person. 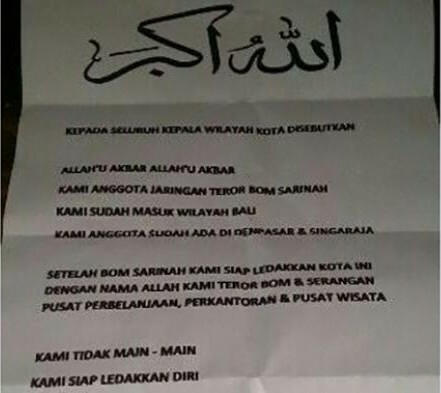 Terror bomb conveyed through a letter that has been given to government officials in Buleleng. After the bombings and terrorist attacks in Sarinah, Jakarta, now the threat of terrorist bombings in Bali have begun. Could the 2016 Bali bombings will happen? The situation in North Bali is now very tense by a mail containing a bomb threat sent to government offices, KantorCamatBuleleng. Jalan Kartini No. 4 A Singaraja, Bali. The letter was sent by an unknown person on Monday, January 18, 2016. The mail stated that as Sarinah bomb terror network members who are already in Singaraja and Denpasar. The letter will attack a shopping center, offices, and tourist center in Bali. Mail bomb threat is disturbing residents of all government officials and the people of Bali. Because, on Thursday, January 14, 2016 terror bombing occurred in the area of ​​Sarinah, which had previously been warned by the terrorists that the bomb would explode in the region. The contents of the letter refer to as members of the terror network Sarinah bombs already in Singaraja and Denpasar. Buleleng Police Chief said the incident began in chronological 08.30 am, when the driver was sitting in the Buleleng district head office parking. At that time, the government official driver suddenly approached by someone unknown man, riding a motorcycle with a closed helmet, wearing a black jacket, and into the parking lot in a hurry. The driver answered questions from an unknown person is, and invited to meet with employees in the government office to deliver a mail. Mail from an unknown person is stored in a white envelope wrapped in black plastic bags. After giving the letter, the stranger immediately leave the government offices. Employees of government offices recipient of the mail from an unknown person, and then open the mail from an unknown person. When opened and read the contents of the letter, found to contain about a bomb threat addressed to the shopping center, offices, and tourist center in Bali. PUSAT PERBELANJAAN, PERKANTORAN & PUSAT WISATA"
SHOPPING CENTER, OFFICE & TOURIST CENTRE "
Very clearly legible, the contents of a letter from an unknown person, the states will commit terror by detonating a bomb in a shopping center, offices, and tourist center. This terror was terrible, because it is not known when the bomb will blow up, where the bomb will blow up, and who the real target. Buleleng Police officers continue to improve the security pattern and expanding the number of personnel on duty.